A general and popular model on a functional approach to leadership is associated with John Adair, who has a long pedigree in this area. Adair’s (1973) model is often cited within the outdoor and expedition literature (e.g. Barnes, 2002; Loynes, 2004; Ogilvie, 2005). 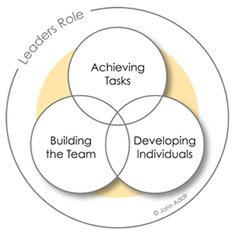 The effectiveness of the leader is dependent upon meeting three areas of need within the group: the need to achieve the common task, the need for team maintenance, and the individual needs of group members. Adair (1973) symbolised these needs, and associated interactions with three overlapping circles. Adair’s (1973) popularised three-circle diagram is a simplification of the variability of human interaction, but is a useful tool for thinking about what constitutes an effective leader in relation to the job he or she has to do. The effective leader carries out the functions and exhibits the behaviours depicted by the three circles. Situational and contingent elements call for different responses by the leader. Hence imagine that the various circles may be bigger or smaller as the situation varies i.e. the leader will give more or less emphasis to the functionally-oriented behaviours according to what the actual situation involves.